Aruba 7000 series Mobility Controllers optimize cloud services and secure enterprise applications for SD-WAN at branch offices, while reducing the cost and complexity of deploying and managing the network. Aruba 7000 Series Mobility Controllers optimize cloud services and secure enterprise applications for hybrid WAN at branch offices, while reducing the cost and complexity of deploying and managing the network. The 7000 Series Mobility Controllers combine wireless, wired and hybrid WAN services, support up to 64 APs and 24 Ethernet ports, and feature integrated WAN compression, health checks, zero-touch configuration, and policy-based routing. The 7000 series also unify policy management with third-party security services, making it simpler and more secure to create a digital workplace experience in head-end and branch locations. 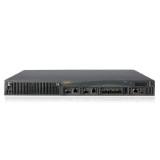 Supporting over 4,000 users, the 7000 series performs stateful firewall policy enforcement at up to 8 Gbps. Secure IP tunnels protect WAN traffic across the public and private transport network to the cloud and data center. 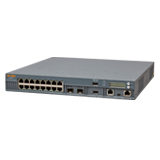 Additional features include integrated firewall, secure VPN, 3G/4G LTE cellular failover, threat management with content filtering, and local bridging, based on end-user application or IT traffic forwarding requirements. The 7000 series supports Aruba’s Next-Generation Mobility Firewall with AppRF™ technology, which continuously evaluates app usage and performance for over 1,500 apps, including cloud and web-based services like Skype for Business, SharePoint, Box, Salesforce.com and apps that are hidden as encrypted or web traffic. It then automatically makes configuration changes in real-time to ensure optimal bandwidth, priority, and network paths in branch and remote offices to safeguard the best possible user experience. A real-time dashboard makes it easy to identify and correct Quality-of-Service tags, load-balance specific applications across APs, adjust RF management and roaming parameters for latency-sensitive apps, and apply bandwidth contracts per app or application type.